For the first time, the two halves of NASA’s James Webb Space Telescope — the spacecraft and the telescope—were connected together using temporary ground wiring that enabled them to “speak” to each other like they will in flight. 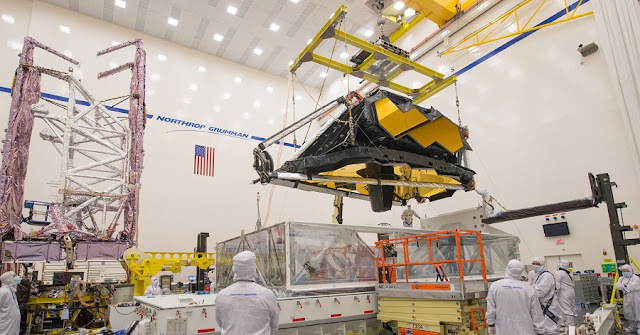 Although it was a significant step forward for the program, this test was an optional "risk reduction" test that took advantage of an opportunity to connect the two halves of the observatory together electrically months earlier than planned. If any issues had been found, it would have given engineers more time to fix them and without causing further delays. As a bonus, it also provided a jumpstart for the separate spacecraft and telescope test teams to begin working jointly as they will when the whole observatory is put together in one piece next year. The James Webb Space Telescope will be the world's premier space science observatory. Webb will solve mysteries of our solar system, look beyond to distant worlds around other stars, and probe the mysterious structures and origins of our universe and our place in it. Webb is an international project led by NASA with its partners, ESA (European Space Agency) and the Canadian Space Agency.